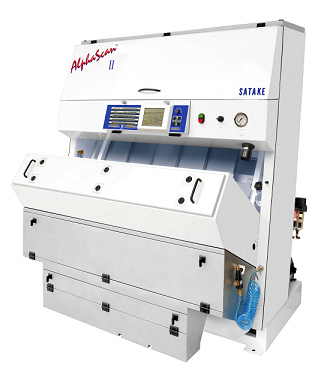 The Satake AlphaScan II is the very latest Colour Sorter from Satake. The original AlphaScan range was introduced to the market in 2004 and quickly gained favour in wheat, barley, rye, rice and other cereal/pulse processing industries. The AlphaScan II is the next generation of 'low cost - high capacity' sorting from Satake. The AlphaScan II is particularly suitable for ergot, foreign grain and stone removal from wheat, black tip removal from durum and the recovery of good grain ejected by mechanical separators. It also has applications in the removal of pink tinted fusarium damaged wheat. Processors of other products such as rice, beans and pulses also benefit from the machine's high capacity at low cost. - New Feeders with Feedback Control – Offer more constant feed rates with fewer mechanical changes to allow more production and reduce stress on feeder. At its optimum capacity of 35 tonnes per hour, the Satake AlphaScan visually inspects more than 250,000 grains per second. The AlphaScan II High Flow has the greatest capacity available.